Describe the task and specify job requirements. We will notify the experts about your job. Wait for proposals and choose one that meets your requirements. You can rely not only on expert`s cost but on experience and rating too. Contact the expert you choose and send all the data for performing the job. Get the notification that an expert has performed the job to your email address. Leave your feedback after the job is performed. It will help other customers to choose the best expert and the expert might be appointed to more jobs. The platform will give a customer and expert an opportunity to find each other with just a few clicks. Simply apply the filters to the jobs and experts on search pages. 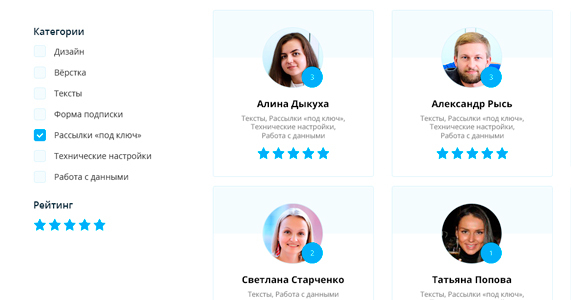 Experts` Rating and Feedbacks about Customers. 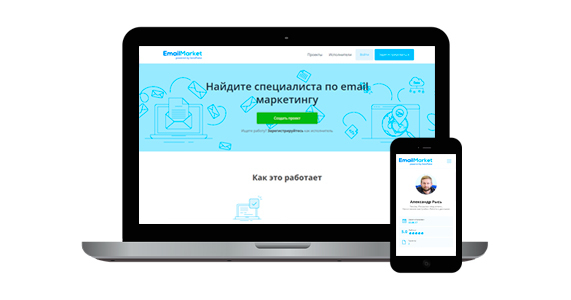 You will find reliable information about customers and experts at EmailMarket. Ratings and feedbacks allow the user to evaluate the reliability of the transaction and take a quick decision on cooperation. EmailMarket interface looks good both on the computer and mobile screens and other devices. It is translated into several languages. Many features simplify your work: adding the job by a customer, specifying contact information, uploading an expert`s portfolio, etc. EmailMarket is powered by Sendpulse within the loyalty program. This is the reason why customers can order marketing services at affordable prices and experts can approve only interesting jobs and get paid for them in time. Бутиковое агентство со специализацией в email-маркетингe, аналитике баз-данных и веб-аналитике. Агентство МАВР специализируется на стратегическом планировании, ведении и повышении эффективности рекламных и email-кампаний в интернете. От стратегии до сопровождения или решения проблем с доставляемостью. Умеем работать с масштабными интернет-проектами, знаем специфику B2B. В емейл-маркетинге с 2009 г. Возьмем на себя дизайн, верстку, интеграцию с CRM, промокампании, настроим триггеры и повысим продажи. Команда SendPulse помогает зарабатывать больше с помощью email маркетинга: от создания шаблона письма до ведения регулярных рассылок. BravePepper - смелые и эффективные email решения для бизнеса. Экспериментируем, получаем результаты и строим историю успеха вместе. What is Email Marketing and Why Do I Need It? Inbound marketing replaces traditional approaches. It appeals to creating of useful and valuable content that engages users. Building company awareness and brand promoting are reached by blog posts, podcasts, video, and of course, personalized email campaigns. That is why email marketing is highly demanded service at our marketplace. to perform regular email marketing audit. You can let a pro handle of your email marketing and get the increasing of website conversion.